Title: YOUNG TROUBLESOME or Master Jacky's Holidays - From the Blessed Moment of His Leaving School To The Identical Moment of His Going Back Again; Showing How There Never Was Such A Boy As That Boy. Description: Philadelphian USA, Davis, Porter & Co. 1850 as entered according to Act of Congress Hand-colored illustrations on 18 pages. . 250x195mm newer cloth spined boards (rubbed to tips) 24pp. Paper uniformly tanned with minor foxing and a few gutters strengthened, first 2 leaves have 2" tears without loss. Now a neat amusing item. *Young Jacky comes home for the Christmas Holidays and brings mayhem to the household. 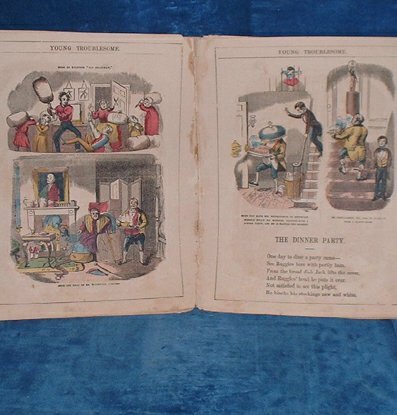 This is an American printing with plates from the 1850 London edition re-engraved and hand-colored.